The “Recent Apps” screen allows you to quickly return to recently used apps. It’s similar to the Alt + Tab feature in Windows. Pressing the “Home” or “Back” buttons on your device does not completely stop the app. It still runs in the background. You may want to remove some apps from the “Recent Apps” list that you aren’t currently using so you have easier access to those apps you use more often. Or, you may want to free up some memory. Although, in Android, you don’t have to close apps, because the system is designed to keep its RAM relatively full. If the system needs more RAM for a newly opened app, it will close a less recently used or unused app on its own. 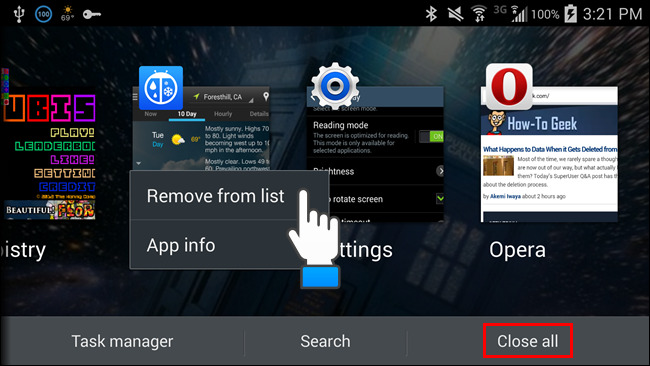 We will show you how to remove an app from the “Recent Apps” screen in Android. 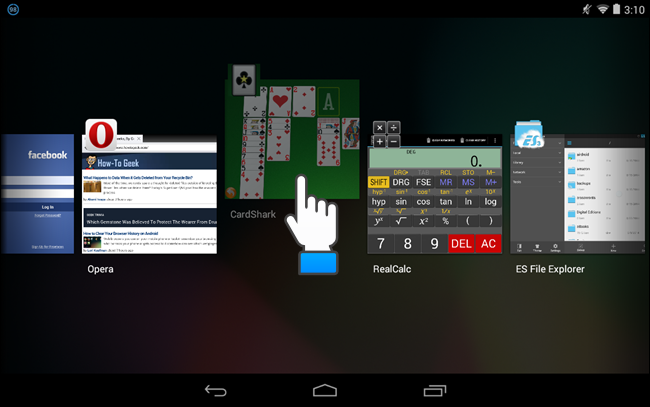 Our example includes a Nexus 7 and a Samsung Galaxy S4. Accessing the “Recent Apps” screen is different on each device and the Galaxy S4 has a feature on the “Recent Apps” screen that the Nexus 7 does not. 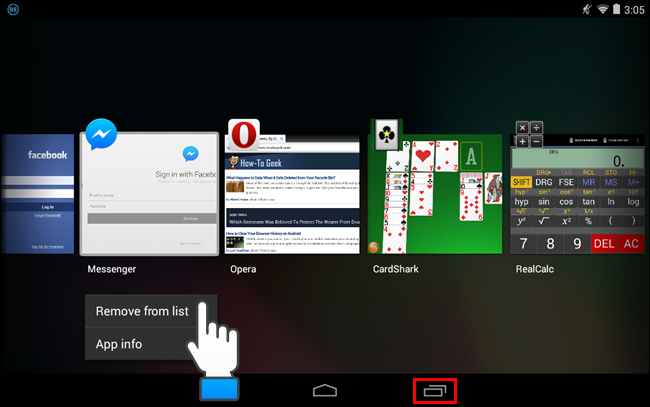 On the Nexus 7, touch the “Recent Apps” button, outlined in red on the image below. Large thumbnails of recently used apps display with each app’s icon. To remove an app from the list, hold your finger down on the thumbnail for the app you want to remove until a popup menu displays. Touch “Remove from list” on that menu. NOTE: Notice the “App info” option available on the popup menu. That option opens the “App info” screen for the selected app allowing you to perform tasks on the app, such as force stopping an app, clearing data for an app, and uninstalling an app. You can also remove an app from the “Recent Apps” list by swiping that app off the screen. If you are in Portrait mode, swipe the thumbnail off the screen to the right or left. If you’re in Landscape mode, swipe the thumbnail up or down. If you’re using a Samsung Galaxy S4 (or other Galaxy S series phone), press and hold the Home button until the “Recent Apps” list displays. Then, you can hold your finger down on a thumbnail and select “Remove from list” to remove an app, just as you would on a Nexus. You can also swipe the thumbnail off the screen to remove it from the list. However, the Galaxy S series phones allow you to remove all apps from the “Recent Apps” list using the “Close all” button, outlined in red on the image below. So, what happens to an app when you remove it from the recent apps list? How-To Geek did some research to find out and you can read our findings.